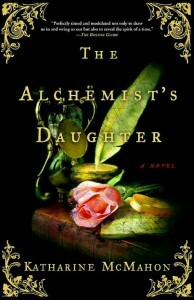 This historical fiction and fifth novel from Katharine McMahon, The Alchemist’s Daughter is set in the center of the Age of Enlightenment, and capitalizes on the quandary at the heart of the era – can reason and knowledge be relied upon to form society? Emilie Selden is the only daughter of John Seldeon, notable scientist and alchemist. While she’s been raised in the laboratory studying alchemy alongside her father, without doubt, the greatest experiment she’s taken part in is that of her own life. Because her mother died during childbirth, John has been the sole director of Emilie’s life and has controlled the influences within it as carefully as he mixes elements over a flame. His hypothesis? Although she is female, he can craft her to be as great as any other scientist – including himself and his friend Sir Isaac Newton. He has recorded her growth, development and progress in journals. Emilie hopes that one day she’ll be able to read these journals, sure that within she’ll get a glimpse of a mother she knows little of. John miscalculates the power of emotion when it becomes obvious Emilie’s heart is being vied for on two fronts. When she makes a misstep while he is away at the Royal Society meeting in London, Emilie learns that not every man’s actions are as reliable as her father’s. As Emilie is thrust into London society, she also realizes that her isolated life at Selden shielded her from the harsh reality of class and economics. I loved this story, with its hints of the Romantic age that would soon be broached. Emilie’s search for self is at times as heartbreaking as it is rewarding. A great complement to my earlier read this year – Remarkable Creatures– anyone who is interested in this time period or historical fiction should find this a worthwhile read.